I have so many cookie recipes and Christmas desserts coming up, it isn’t even funny. I hope I can get them all posted by Christmas, but as usual, I have probably over-baked and over-prepared, and made more than I have time to post for you. It’s a fun problem to have though! Get ready for a cookie-palooza coming up. 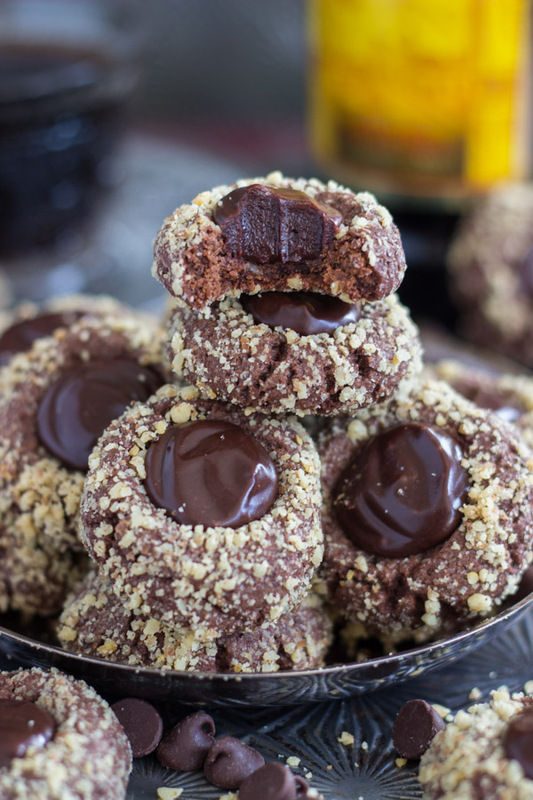 Starting with these lovely Chocolate Hazelnut Thumbprints with Kahlua Ganache! My waistline is paying for it, and the freezer is bursting at the seams. And we are still weeks away from Christmas, so I have a lot of sugar-consuming in my near future. I’m visiting family in Indianapolis this weekend, and I was so excited that I could carefully pack a bunch of cookies to take with me, and I could unload a lot of baked goods on my sweet-tooth family, but of course, I forgot them in the freezer. We made an extremely last minute, improptu trip to Indy for the Big Ten Championship game this weekend when my alma mater, Penn State, unexpectedly won the Big Ten East division, making it into the championship. We are so excited – more specifically, I am super excited. S.O. is excited too, but doesn’t share quite as much as enthusiasm as I do. He’s more of an NFL guy. After painstakingly wrapping up cookies so they’d make the trip without shattering, I’m bummed that I left them behind. My family will be even more so! 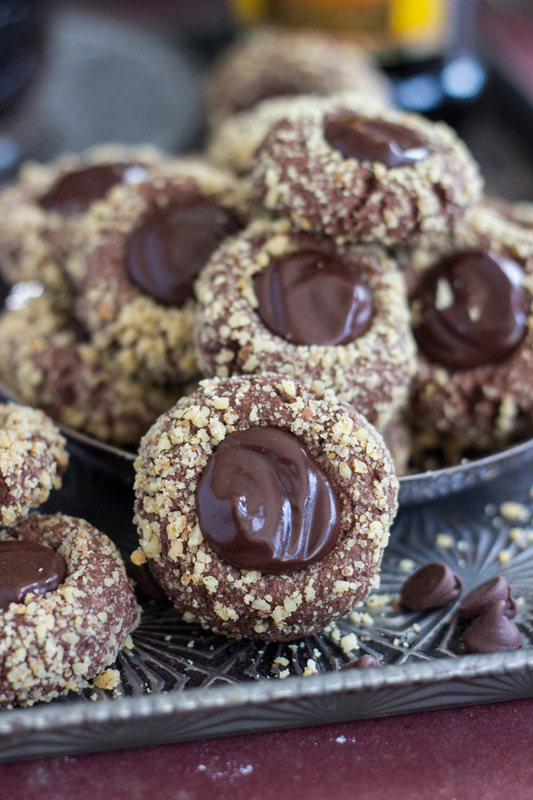 One of them was these Chocolate Hazelnut Thumbprints with Kahula Ganache. I wanted these to have a coffee-like theme, and yet, I didn’t actually include coffee or espresso in the cookies. Probably a good thing, since not everyone really likes coffee, but may really like Kahlua and hazelnuts. 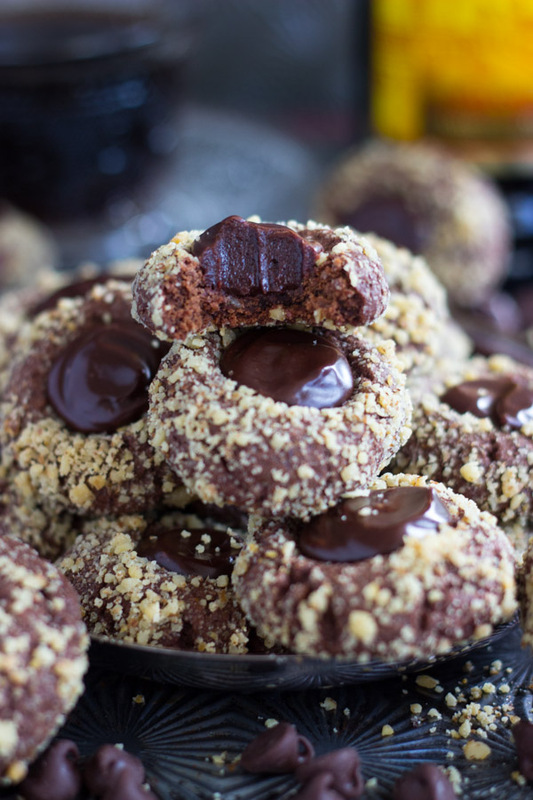 I’ve made a similar chocolate thumbprint cookie for Christmas, and it was these Dark Chocolate Peppermint Patty Thumbprints. They’re a soft and chewy chocolate cookie, but they’re sturdy enough to hold a big dollop of ganache in the center. You know how thumbprints are distinctly a little bit denser than most cookies so that the centers will hold up with filling! 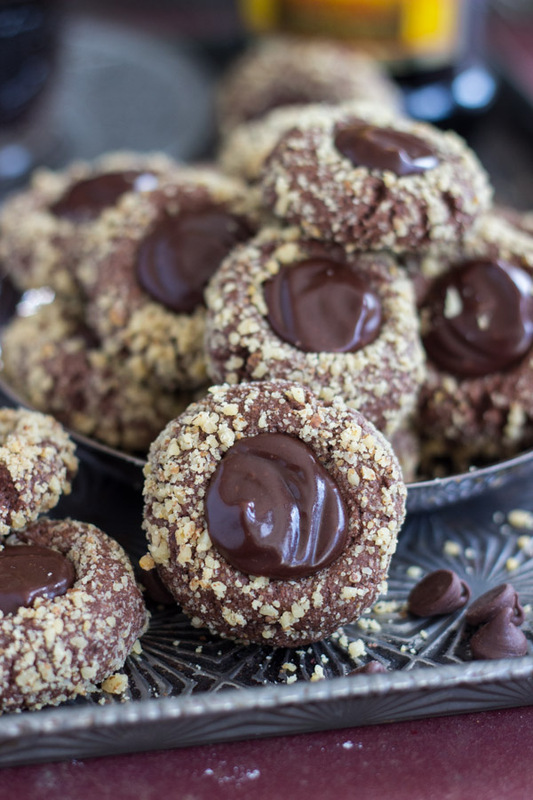 These Chocolate Hazelnut Thumbprints with Kahlua Ganache are dusted with finely chopped hazelnuts, and filled with a semi-sweet chocolate ganache, spiked with Kahlua. Ganache is one of the best foods in the world without booze, but is that much more ridiculous when given a boozy jolt. 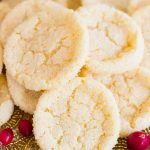 Thumbprints are a favorite holiday cookie of mine – the possibilities and variations are so limitless. They’re always really pretty on a cookie tray, and these feature such a nice flavor combo! 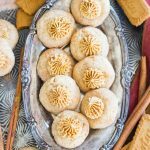 If you also love thumbprint cookies, check out these Snickerdoodle Thumbprints with Cookie Butter Buttercream. That buttercream is insane! And these Chocolate-Covered Strawberry Thumbprints are AMAZING. They’re filled with strawberry jam and ganache. They’re crazy good. Lastly, some popular Christmas cookies around here are these Cracked Top Ginger Cookies, which we love so much that we make them year-round. And you can’t go wrong with Classic Sugar Cookies – so thick, chewy, buttery, and rich! One of the BEST cookies I’ve ever had! Add dry ingredients to the wet ingredients in the mixing bowl, and beat until just combined. Refrigerate for 1 hour or until dough easily forms into a ball. 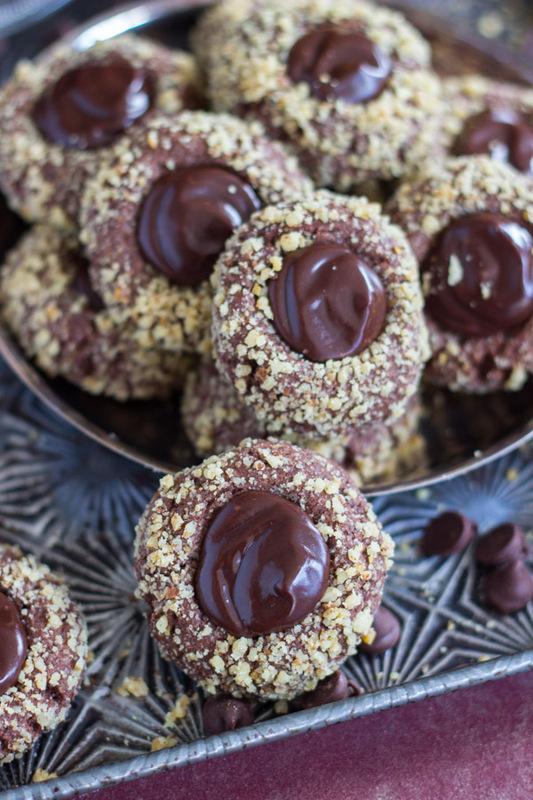 Roll each ball in the chopped hazelnuts until well-coated. Place each ball 2 inches apart on greased baking sheets. Pipe or spoon into the center of each cookie. Allow 10-15 minutes for the ganache to slightly set. Devour. 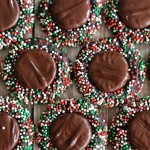 Dark Chocolate Peppermint Patty Thumbprints. With Sprinkles! Wow I never tasted anything like it. It tastes like some european treat. 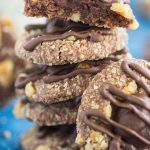 The chocolate and the chopped hazelnut in the center of the cookie adds just the right amount of sweetness to the cookie. The cookie itself is soft chewy & it is not dry, the toasted hazelnut within the cookie is subtle yet gives the cookie its unique woody hazelnut tone. They kinda toast when you bake the cookies, so I don’t usually toast first! 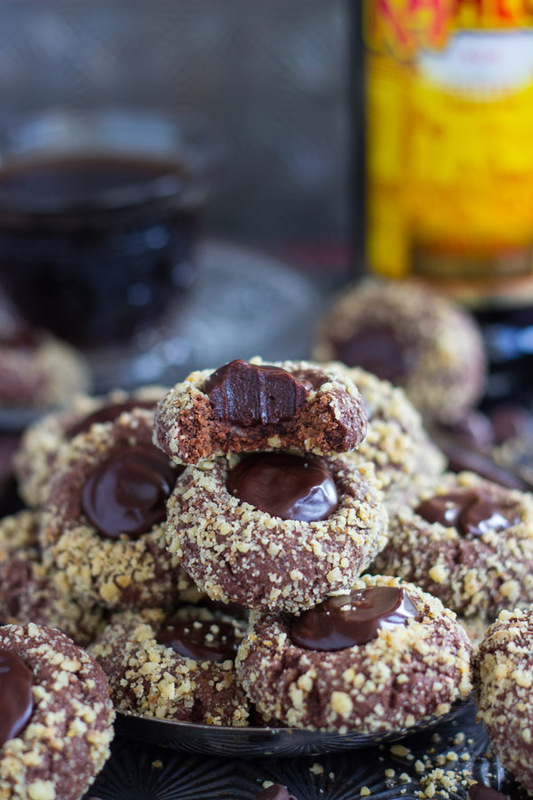 I love the hazelnut, chocolate and kahlua combination… Definitely making them!!! They’re so lovely! Let me know if you try them! I just made these. They are AWESOME. A super rich, moist cookie with an amazing ganache. Going into my Christmas rotation for sure. Will the gnache set? I want to bake these for a party but cant transport them if the middle is watery! Thanks! Hi there! The ganache sets! It won’t be watery or liquidy, but it’s not going to set up as hard as chocolate, obviously. It’s softer…. like the center of a truffle. Does that help? Let the cookies set. When you transport, if you layer them, put parchment or wax paper between layers of cookies. I hope you like them!! Everyone loved these cookies!! They also looked beautiful. The only thing i would say is the recipe made way too much ganache. I would cut it at least in half the next time. If I make them now, what is the best way to store them for the next week or two till Christmas? I normally keep my cookies either in tins or plastic containers in a cool room, but I am concerned about the panache. Thanks. Hi Monica! I would freeze them! If you can freeze the cookies only, and just make the ganache the day before you’re serving them, that’d be the most ideal way… you can fill the cookies after they defrost. Otherwise, you can still freeze them with the ganache. I’d let them set up thoroughly first, then layer them with wax or parchment paper in between, and put them in your tins or plastic containers to freeze! Make sense? Agree. I was trying to avoid the last minute ganache, but I don’t think that’s possible. We want delicious cookies! Thabks! These cookies are out of this world!!!! Soooooo good. I made them while at home and had to stop my dad from eating all of them. They’re easy to make and absolutely delicious. The ganache was definitely way more than I needed so I froze the leftover ganache so I can make these again next week! I will also make the indentation deeper using a wooden spoon instead of my thumb next time. I used the hazelnut Kahlua since it’s what I had on hand and it was perfect. Thank you! LOL! Yay! I’m sooo happy to hear this! Thanks for this comment – it seriously made my day. I’m so glad you liked them, and hazelnut Kahlua is such a bomb idea! I’m going to steal that for the next time I make these. I had another comment this week that it made extra ganache. I don’t remember having extra when I make these, but I’m glad you were able to just freeze it for another batch! Thanks for the feedback. 🙂 Happy holidays!!! The cookie looks and sounds wonderful! I going to add to my Christmas cookie list. Does the 1/2 c of ground hazelnuts go in the cookie dough or is it just to roll the unbaked cookie ball in? Hi Jane! Just for rolling the unbaked cookie balls! I find hazelnut extract at Walmart though, believe it or not – it’s the Watkins line of extracts and they make a TON of flavors. 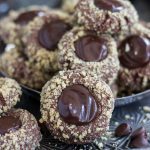 Super Walmarts and Walmart Neighborhood Markets will have that if you want it to have an extra punch of hazelnut, add a teaspoon of hazelnut extract to the dough and/or ganache. 🙂 Let me know if you try these! Hi Sarah. I made these last night and loved them! I definitely will them make again. Thanks for telling me about the hazelnut extract. I went right out I bought some to use next time. This time I used Kahlua so good! Have a wonderful holiday! I tried making these and the cookies went completely flat. I checked and dble check the ingredients, and I did not leave anything out. Any suggestions? Hi Linda: I’m so sorry that happened! I’ve made these with good results, and the ingredients are correct – I just checked. Did you chill the dough? This definitely helps with preventing them from flattening and spreading. Instead of chilling for just an hour, try chilling thoroughly, for 3-4 hours, or even overnight. That should help quite a bit. Also, do you use parchment paper or silicone mats on your baking sheets? This seems to help spreading too! I’m sorry you had an issue – thank you for letting me know! This was an AMAZING recipe!!! They were a crowd favorite at Christmas for sure!!! Thanks!!!! JUst got done adding the ganache. I have to admit..finding hazelnuts alone in FL was difficult. I had to order them via mail. They make a nice presentation. Only issue I have is that I have a lot of left over ganache. Any ideas on what to make with it? Also, do you think I can save the ganache and reheat it? 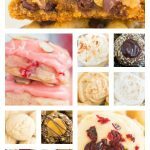 How would you store these cookies? Are you making a lot ahead of time? If so, I would freeze the thumbprints unfilled, and then fill them a day or two beforehand. Make sure they all set, but then you can lightly layer them with Saran Wrap or parchment paper in between layers, and they shouldn’t get dinged up. Absolutely!! You could definitely sub pretty much any nut! I used the same chocolate cookie dough to make Turtle Thumbprints earlier this year, and I have Chocolate Walnut Thumbprints coming up in a few weeks. 🙂 I’m so glad you liked them! Did you have any critique or other feedback? Thank you so much for your comment! !